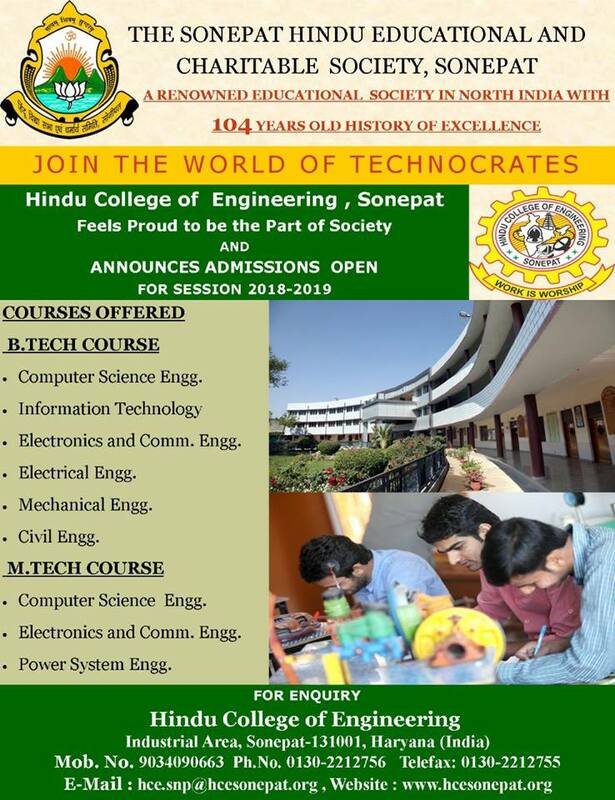 The department of Computer Science Engineering of Hindu College of Engineering offers 4 years Bachelor degree course (B. Tech.) and 2 years Master degree (M. Tech.). The laboratories are equipped with latest computing facilities including application software, compilers and hardware. The dedicated leased line Internet connectivity provides the students a platform to cope up with the needs of the growing software industry. The dynamic, experienced and well qualified faculty exposes the students to a rigorous and exhaustive curriculum designed to bring out the best in them and to keep in touch with the latest state-of-the -art technology. The CSE Conference/Seminar hall is well equipped with the LCD projector to provide aid in the teaching methodologies. The course of Computer Science Engineering is the back bone of all the industries with special application to the IT industries. The basic knowledge of ongoing research and numerical methods help the students in achieving the skills. Therefore, the natural derivative existence of a high demand rate of such engineering, this course prepares the student for a carrier in any of the main areas where he/she can put the knowledge to practice. The knowledge is enough to seek a position in any organization engaged with computational work and software development applications. In addition, the students are taught about the Moral Values and Engineering Ethics and Oral Presentation Skills. The students also gain the knowledge of Environmental Studies, Economics and Management Studies. In M.Tech. course, the students are also taught about the advanced terminology and recent trends in the Engineering and Technology. During the Dissertation phase, the students perform their research work in their respective area with dynamic simulation environment. The students usually present their research work during National & International Conferences and Journals.